Wayward daughters. Missing Husbands. Philandering partners. Curious conmen. If you've got a problem, and no one else can help you, then pay a visit to Precious Ramotswe, Botswana's only - and finest - female private detective. Her methods may not be conventional, and her manner not exactly Miss Marple, but she's got warmth, wit, and canny intuition on her side, not to mention Mr J.L.B. Maketoni, the charming proprietor of Tlokweng Road Speedy Motors. And Precious is going to need them all as she sets out on the trail of a missing child, a case that tumbles our heroine into a hotbed of strange situations and more than a little danger. Delightfully different, The No. 1 Ladies Detective Agency offers a captivating glimpse of an unusual world. Some lovely observations about the place, but it's largely really simplistic. The characters aren't complex, the dialogue between them is really childish - it makes the people sound very naive and simple minded. There are many broad generalisations being made about the different ethnic groups and about men and women in particular. Given that this is a book written by an Englishman about African people, the naivety of the characters feels condescending. There's a running theme about the 'good old days' and what 'real Africa' is and should be. I think those types of themes need to be handled carefully especially when written by an outsider, and nuance is important. This lacked that, and it came across as a simplistic view of a complex place and people (as if Africans should all be child like and sit around watching cattle). The narrator added to this feeling, a very British primary school teacher accent and tone. An actor from Botswana would have been perfect, or at the very least someone who could sound like Precious Ramotswe. Lovely book, easy to listen to, very entertaining. Innocent. Had heard of a number of others who had read/listened to this book, so although the title had originally put me off, I decided to try it myself. I was glad I did - this was a thoroughly enjoyable story and the narrator did a good job of bringing it to life. Definitely agree - easy listening! Being from South Africa, is was a good reflection of "ubuntu" and the lead characters approach to detecting was, at many times, cute! somehow I couldn't believe a word from 'the lady'. Very black and white, all men are cheaters or stupid. I thoroughly enjoyed listening to this Audiobook, having already watched the series on television. It captivated my attention and I found jobs to do that allowed me time to finish listening to it. The story gave a view into a totally different world to mine which I found fascinating. Having listened to the incomparable Adjoa Andoh narrate the rest of the series, it was a bitter disappointed to discover that Hilary Neville is incapable of even pronouncing 'Gabarone' correctly. I was unable to listen for more that 2 minutes and regret my purchase immensely! I loved listening to this recording. I was a fan of the original book and having re-aquainted myself with it I realise that these characters/stories were just made to be read aloud. It was a bargain too, well worth the price. I really enjoyed this and am planning on getting the next one. It is a homely story that you can listen to whenever. You warm to the character she is a good woman and makes you like her straight away. The book is set in Botswana and reflects all the good things about the country. While very precise and correct, an African accent would have clinched it! I watched the TV series and either actress would have been excellent to listen to! The TV series spin off of the books are good fun but this is insightful too... well worth a download. Bought this as a recommendation and didn’t regret it. The reading took you to the warmth of Africa as well as the warmth of the character. There is no doubt that Alexander McCall Smith can write a book that is the most sublime experience to read. It's like a hot chocolate, in front of a warm fire, on a cold winter's day. 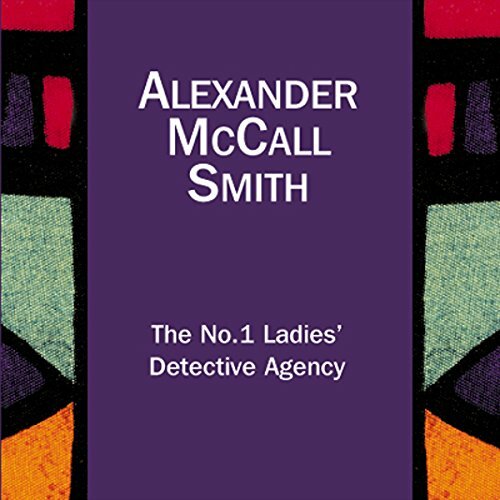 There is nothing to dislike about The No.1 Ladies' Detective Agency series. The stories are divine, they conjure the most wonderful imagery until the reader feels they are actually in Botswana. Mma Ramotse is a fabulous character and I love every single book in the series. However, as is my habit, I haven't listened to the stories in order, and further on the books are narrated by Adjoa Andoh. Hilary Neville did a perfectly good job narrating, but Adjoa Andoh really brings the book alive. If I hadn't heard her narration, I'd have not had any issue with Ms Neville's performance, but I have. I will be buying more of the series, but only books narrated by Ms Andoh, as she really brings something very special to the audio version. Well worth a listen, it's a real treat.